If you’re a parent, and have tried finding quality organic items, you know it can be challenging. I was shopping in a well known baby store and couldn’t find one clothing item organic or made in the USA. I asked customer service, who called the manager. He looked through an inventory book and eventually found a few “organic” toys made in China…that was the extent of their collection. Luckily we have the internet, and great shops like Wild Dill. Wild Dill is an online shop dedicated to natural, organic and responsibly sourced baby and children’s items. This Mom run and owned company offers many unique and attractive items for little ones. Read Mama Banana’s Adventures Organic Bunting Bag Review and learn more about the company. One lucky winner will take home a GC to this online shop! Check out the details below and thanks for stopping by. the closing part 🙂 I care for such info much. 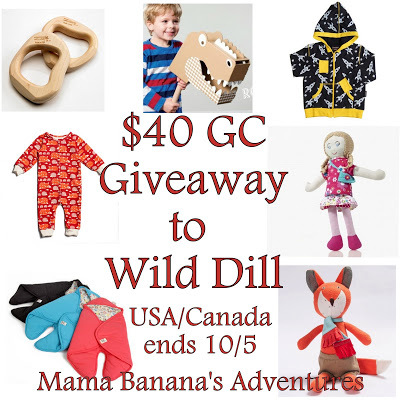 Wild Dill support green businesses run by moms! I learned they are made with azo-free dyes and fasten with velcro. They also come with matching ears and tails. Very adorable and cozy looking.